There really is not another Leather Handbag in the world like it! :-). Introducing my leather and silk ecoprinted handbag. I ecoprint on both fabric and leather and the results are exciting! 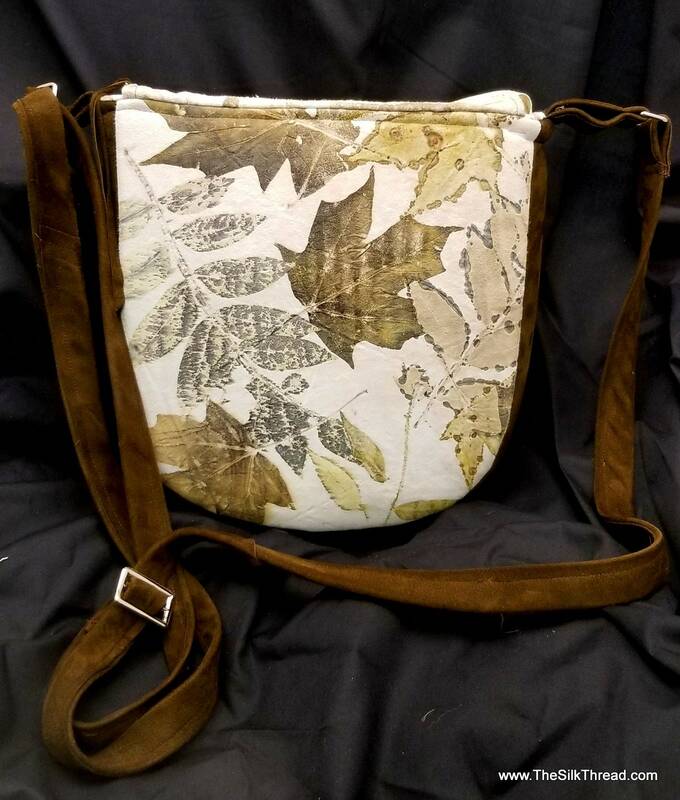 I first collect various leaves and foliage from my NC farm and through a natural process, imprint them onto my calf leather and silk noil fabric, (which is "raw silk" a heavier, beautifully draping silk). I work my calf leather into beautiful ecoprinted designs on the hides from which I make handbags, journals, shoes and clothing. (watch for more!) The colors you see are the actual colors Nature released to me that day as I imprinted my pieces. This beautiful handbag showcases my ecoprinted design on the front while the back is a solid chocolate brown leather. The bag is 11" high x 10" wide by 3" deep, a perfect size for any event! The zippered recessed top and lining are made from heavy silk noil which has been ecoprinted to create the design. Inside is a zippered pocket and a slip pocket giving you plenty of space, stability and security for your items. The adjustable leather strap is 60", a great length for on the shoulder or crossbody.